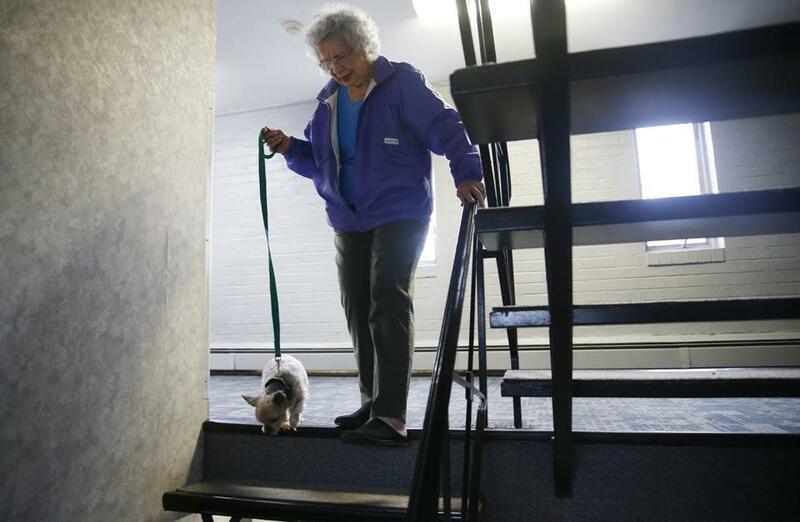 Doris Toohey, 85, walked down the stairs at her condo in Brighton with her dog, Bonnie. Since her building’s elevator broke down in August, 85-year-old Doris Toohey has had to climb 56 steps to get to her fourth-floor condo. It’s so exhausting that she sometimes takes a break on her way up by sitting on one of the plastic chairs set up on each floor to let seniors rest. “Especially when I have groceries, it’s so tiring,” she said. The shutdown of the elevator, due to mechanical failure, is bad enough for Toohey, who is constantly up and down the stairs on an arthritic knee to go to the store, doctor’s appointments, church, and to walk her beloved Yorkshire terrier, Bonnie. But what really floored her was the recent announcement that the elevator will remain out of service for about six months, maybe longer. The situation is complicated by the fact that Toohey lives in a 72-unit condo, not an apartment building. If she were a tenant, she could report her landlord to city officials, perhaps Inspectional Services or elder affairs. But in her case, there is no landlord, just 72 owners. The building is run by an outside company hired by the board of trustees. It’s a little hard to figure out exactly what went wrong at the Towne Lyne House condominium near Oak Square in Brighton. Since visiting Toohey, I’ve touched base with the condo association’s lawyer, the building’s property manager, the City of Boston (mayor’s office, fire department, and inspectional services), and the state (office of public safety and the architectural access board). I’ve talked with an elevator mechanic, a real estate expert, and a lawyer who specializes in condo associations. I’ve even gone to Brighton District Court to pull the file on criminal charges filed in 2013 against a former condo association trustee who used a crowbar to break into the elevator room and vandalize it. (He got probation and was ordered to refrain from condo association issues). Everyone I talked to was sympathetic. But nobody seemed to have an answer. That somebody is the condo association’s board of trustees. When you own a condo, you and your property are subject to the legal strictures spelled out in a master deed and a declaration of trust. Trustees are elected by owners to set policy and oversee projects; the day-to-day maintenance is usually handled by a property manager working for a management company hired by the board. Being a condo trustee is considered by many to be a thankless task. (I left messages with two of the Towne Lyne trustees but did not hear back from them; I couldn’t find publicly listed telephone numbers for the other two). Trustees oversee capital improvements, such as a new roof, drawing from owners’ monthly condo fees (currently $400 a month at Towne Lyne, Toohey says) and an occasional special assessment for big-ticket projects. Janet Aronson, the lawyer, expressed concern for Toohey. But things wear out and need to be replaced, she said. And it takes time for custom-made parts for the 50-year-old elevator to arrive and be installed, she said. “This is a condo building, not assisted living,” she said, echoing a comment Toohey had heard from the property manager. The Towne Lyne’s property manager was G&G Management until January 2016. That’s when Great North, which bills itself as one of New England’s largest managers of condominium associations, bought its smaller competitor. Lou Gargiulo, a former New Hampshire state legislator and Trump for President county chair, founded Great North. He told me his company is doing all it can to expedite the elevator repairs but that some things can’t he helped. What would he tell Toohey? “Unfortunately, I do not have a good answer,” he said. Gargiulo got a little hot under the collar when I asked why the company didn’t do more to guarantee that the elevator would be repaired as quickly as possible. “Fake news,’’ he muttered. Patrick Moriarty, an elevator mechanic who previously worked on the Towne Lyne elevator, said the rooftop elevator room became a battleground for trustees. He said someone was constantly turning down the air conditioning in the elevator room, maybe to save money, which harmed the elevator’s machinery. By the end of last week, city inspectors had made a visit to the Towne Lyne House on a fact-finding mission and state officials were considering what they might be able to do, too. 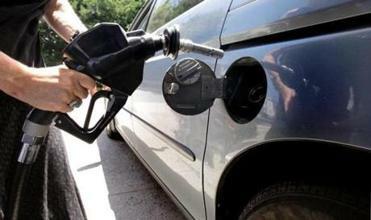 Toohey, a retired executive secretary, had stirred the pot. (Consider me the spoon).